FairyFoot, I saw your question a couple of days ago in the Shoutbox and replied there, but you must not've seen it. According to a source of mine that follows USPS new issue announcements very carefully, there is still no date announced for this issue. It _was_ originally tentatively announced for January, but the USPS pulled back from that, and haven't supplied a better date yet. Thanks, we shall just have to wait patiently! Meanwhile, it appears many post offices don't have any of the old ones left. FairyFoot , I saw your question a couple of days ago in the Shoutbox and replied there, but you must not've seen it. FairyFoot, I read last night that it's expected to be released February 22nd, but there was a link for pre-orders that seems to have now been pulled, so I don't know if that date is good or not. I understand that the printer has had difficulties in producing this issue, and that that's been the reason for the various delays. Thanks for the update. I wonder what date I will receive my first! Was real surprised when these came in the mail today. Thought they might be hard to come by, since they are only sold as a roll of 10,000. Today's "Postal Bulletin" revealed that this United States 5-cent Grapes coil stamp will be issued tomorrow, February 19. The stamp, issued in a coil of 10,000 for use by bulk mailers, will not have a ceremony and first-day postmark reading Kansas City, Missouri. The booklet of 20 stamps features five different illustrations: a double-spoon ice cream cone, an egg crème, a banana split, a root beer float and a hot fudge sundae. The geometric silver-toned patterns in the selvage and on the booklet evoke a classic chrome-accented soda fountain. Illustrator Nancy Stahl of New York City worked under the art direction of Ethel Kessler of Bethesda, MD to create the stamps. Shame they are self-adhesive? No licking! I too like to get hold of the moon forever stamp. Placed an order for it. Colorful Celebrations forever stamps will be issued Friday, June 3 at World Stamp Show-NY 2016. Monday, May 30 the Service Cross Medals commemorative forever stamps will be issued at World Stamp Show-NY 2016. 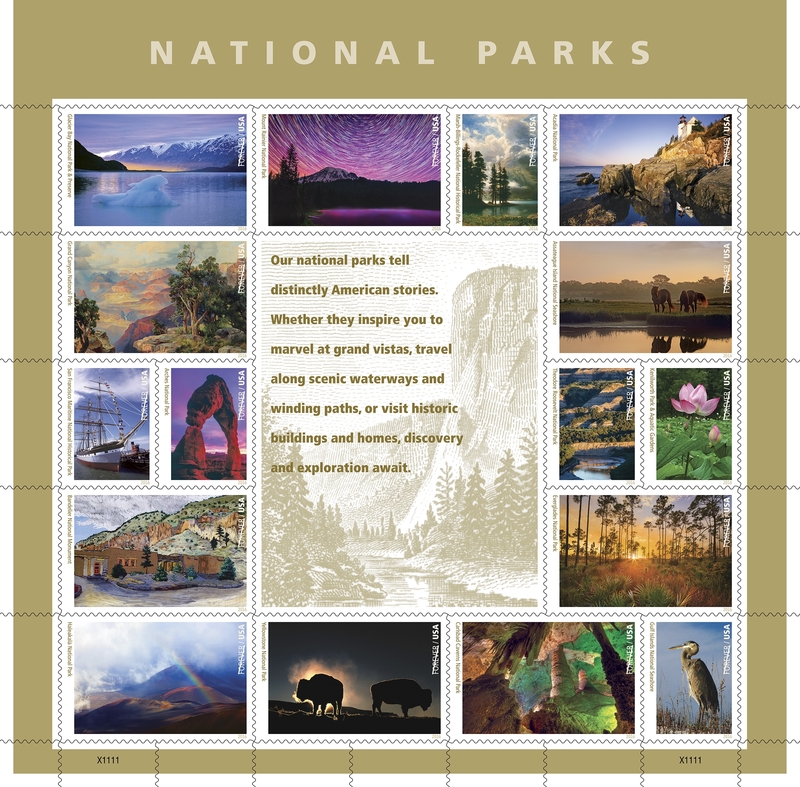 The stunning pane of 16 National Parks Forever stamps that celebrates the National Park Service on its 100th anniversary. The first-day-of-issue ceremony will take place at New York City’s Jacob Javits Center at 11 a.m. as part of World Stamp Show-NY 2016, the world’s largest stamp show that takes place in the United States once a decade. Dedication ceremonies will also take place at or near each of the national parks associated with the stamps. Stopped at the post office this morning to pick up some stamps, hoping to get a variety, but had to settle for the new flower stamps. It was that or the flag stamps, in which I am tired of. I was surprised to see that they were being sold in booklets of 10. When was the last time you seen this? Located on the north coast of Puerto Rico, near the town of Arecibo, sits La Cueva del Indio, or the “Cave of the Indian.” The cave, which is more of a rock formation with daylight shining through, is full of ancient petroglyphs (rock carvings). These carvings were made by the Taíno Indians centuries ago. Many believe special ceremonies were held in and around the cave. The drawings in the rocks may have recorded these events. The Taíno inhabited the Puerto Rican islands, which they called Borinquen (Land of the Valiant Lord), long before Europeans arrived. But when Spanish explorers reached the area in the 1490s, the Taíno were enslaved. The Indians were exposed to new diseases and their population quickly declined. Today, little of the Taíno tribe or its culture remain. When the cave was rediscovered in 1982, it was immediately protected to preserve the historic artwork. In 1992, it was declared a National Reserve, and it was placed on the National Register of Historic Places in 2003. The images and symbols engraved in the rocks represent an ancient culture and the customs of a tribe long-lost, but not forgotten. Through the continued preservation of the cave, the memory of the Taíno Indians will be kept alive for centuries more. Songbirds in Snow. Will be issued on August 4, 2016. Jack O'Lanterns will be issued on September 29, 2016. The 31st stamp in the Literary Arts series honors Henry James (1843–1916), a towering figure in American literature. In novels and stories that often explored the complex interplay between Americans and Europeans, James sought to portray the intricacies of society and the inner lives of his characters with exquisite realism, an intellectual and artistic achievement that earned him a reputation as one of the greatest writers America has ever produced. 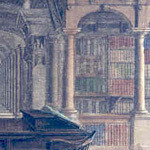 The stamp features an original painting. On the left is a portrait of Henry James based on a 1906 photograph by Alvin Langdon Coburn; on the right side, behind James, is a vignette showing a man and a woman in a small boat, an artistic interpretation of the climactic scene from James’s 1903 novel, The Ambassadors. The artist for this stamp was Kate Sammons; the art director was Antonio Alcalá.